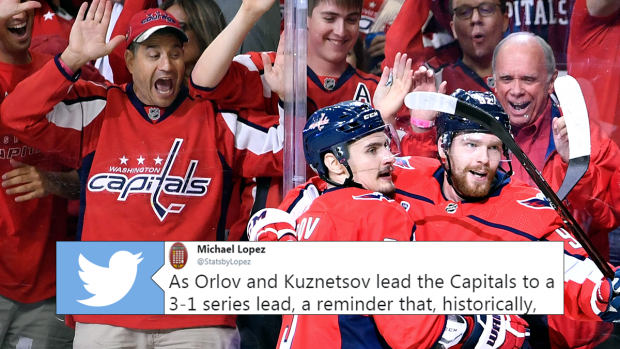 Evgeny Kuznetsov may be emerging as the Conn Smythe favourite in the Stanley Cup Final as he continues to extend his lead as the leading scorer in the 2018-19 playoffs. Since returning to the lineup in Game 3 after suffering a shoulder injury in Game 2, Kuznetsov has potted six points in two games. That made his total seven points in the four games (Despite only playing four minutes in Game 2) and gave him 31 overall in the playoffs. He is five points above the next player (Alex Ovechkin with 26 points) and everybody is marveling at his skill. With all of this happening, one thing seems to be coming to everyone’s mind and that’s where Kuznetsov was drafted: 26th overall. The Russian forward was one of the most skilled players in his draft class, but many believe he fell because of the possibility that he could stay in the KHL. Over the years, that has rarely been the case, which has allowed certain teams to capitalize on some of the most talented players dropping lower than they probably should. So, some advice is being offered to NHL teams and it is two-fold: Always draft the best player available and don’t be scared about players staying in the KHL. Evgeny Kuznetsov is Example #1 of why you draft the best player available even if you have to wait an extra season or two to put him on your NHL lineup. Still insane to me that Kuznetsov was the 3rd ranked European forward and didn’t get picked until the 26th selection in the 2010 draft. GMs were way too scared about him staying in Russia. Vegas isn't the only Cup Finalist to benefit from Florida's mistakes. In the 2010 NHL Draft, the Panthers had 3 1st Round picks and took Erik Gudbranson (3rd), Nick Bjugstad (19th), and Quinton Howden (25th). At 26th overall, the Washington Capitals drafted Evgeny Kuznetsov. This logic could be applied pretty soon for several teams in the NHL, one of them being the Montreal Canadiens. Filip Zadina is widely considered to be the third best player in the upcoming draft, but it’s possible they could focus on getting a centre or defenceman. Interesting comment from Filip Zadina pertaining to #Habs in @Michael_Traikos story: "Montreal, I know very well. I've been to the city many times and they're fans are awesome. But I think they're looking for a centre or a D."
If we’ve learned anything from these playoffs, it is that you should draft whoever you think is best, regardless of position.